It’s hard to believe that just one year ago, Creative Works was an empty shell, home to nothing more than a family of pigeons. Fast forward to 2019 and the building is unrecognizable in terms of both look and atmosphere. In a matter of months, we’ve managed to transform it into a center for business growth and learning, and most importantly, a place East London creatives can call home. Before I reveal how we did it, I’ll provide a bit of context. 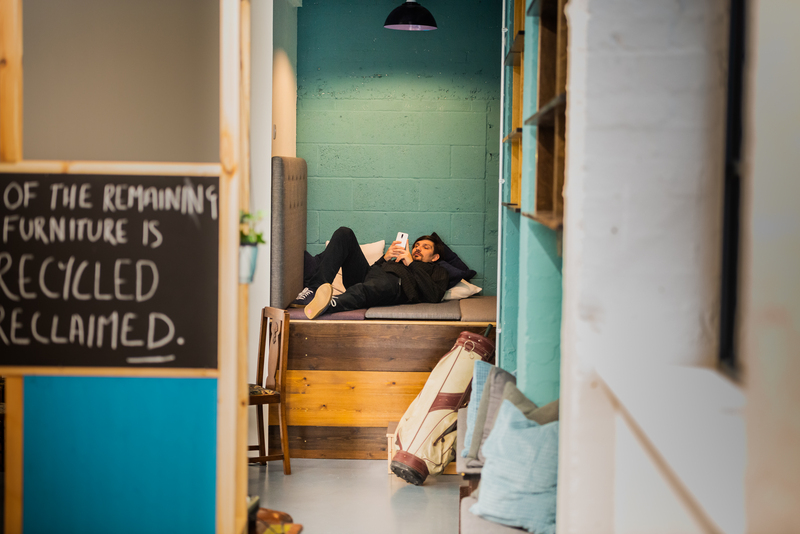 You see, Creative Works is different to other coworking spaces: we’re a Community Interest Company (CIC). We received a £3.6m investment from Big Issue Invest, GLA, Charity Bank, and CAN Invest. 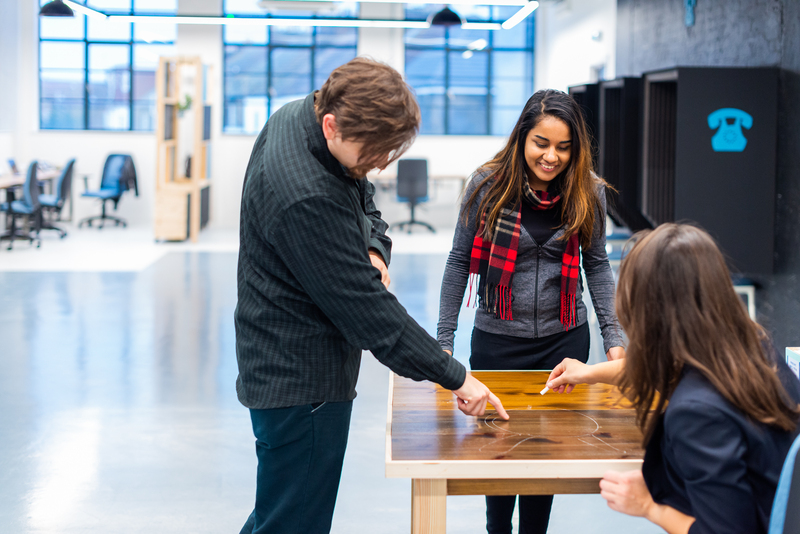 Our social enterprise structure means that our profits are used to provide further learning and development opportunities for our members and the apprentices who also utilize our space. 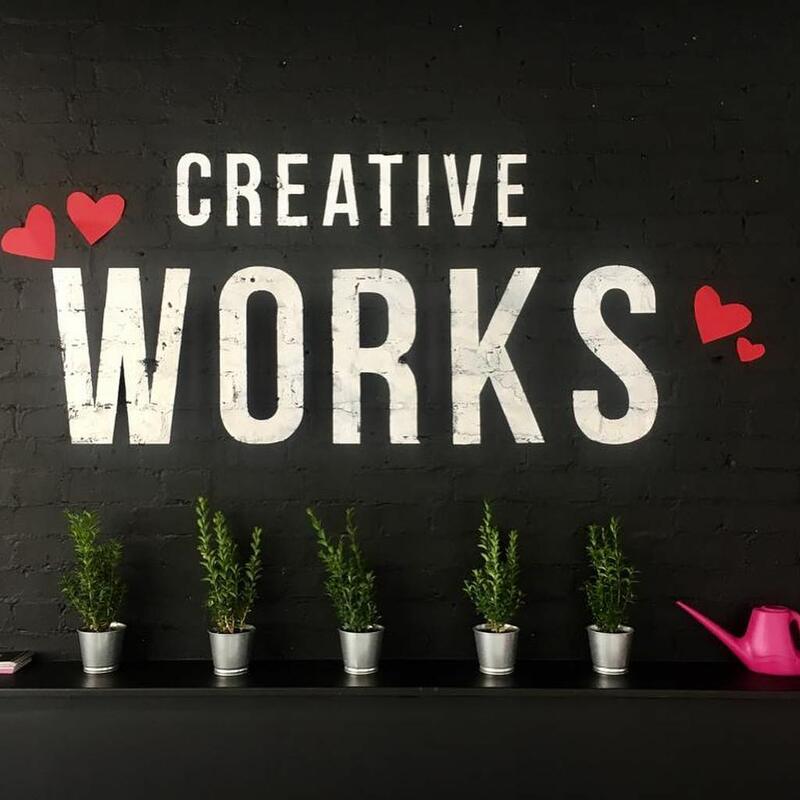 Creative Works will form part of a new “Big Creative Village” masterminded by Big Creative Education and led by Founder and Managing Director Alexis Michaelides. Our apprenticeship initiative is one of the things that makes us truly unique. It’s proving very popular and we’ve received a lot of local press coverage around it (see page four in the link). All our members have the opportunity to hire an apprentice from Big Creative Education (BCE), a further education Academy and Skills Training Provider just a few doors down the road. As you can imagine, being a CIC means we need to keep a close eye on our profit margins and keep expenditure at a minimum. So how – with such a super lean team – have we managed to pull it off? As I mentioned, building the space with a limited budget and lean team posed a challenge. But with determination, hard work, and a whole lot of creativity, we got there in the end and surpassed the expectations of everyone – including ourselves! In fact, we found that it made us more resourceful and environmentally-conscious. We started the design process back in 2018 when one of BCE’s neighbors had to close down its warehouse. Just as they were about to throw away a lot of wood and other scrap materials, I hired six guys to help me rescue it with the view of repurposing it for Creative Works. Shortly afterwards, I set up a workshop behind BCE and hired Cesar, a very talented local carpenter, to transform it into furniture for the space. We were both presented with a couple of obstacles: I’d never designed or made furniture before and Cesar had never worked on a project of such scale. 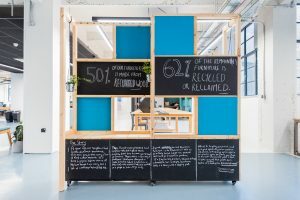 Regardless, we worked super hard for five months to design and build 15 two-by-two bay dividers, 56 workstations, a breakfast bar, a bespoke boardroom table, and a miniature library complete with a sleeping pod. 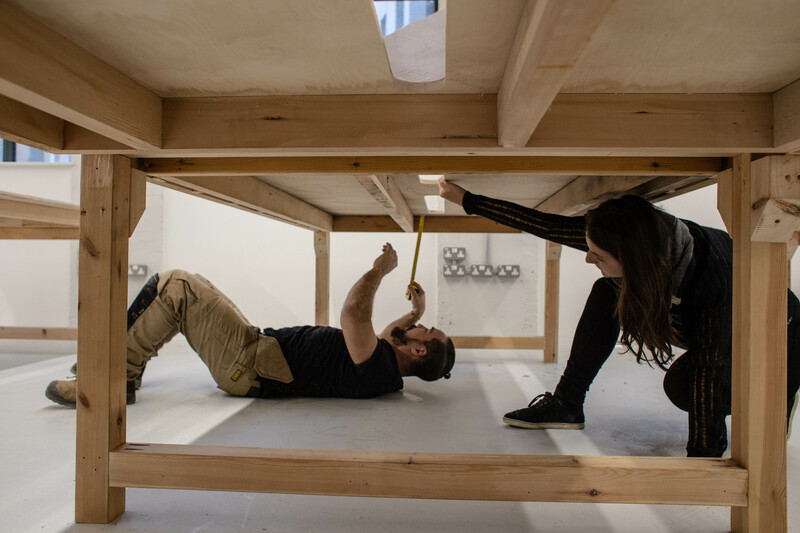 Here’s a snap of Cesar and I working together to build the furniture for our dedicated coworking area. 82% of Creative Works’ furniture is made from recycled or reclaimed materials. Members can unwind and refocus in the ‘sleeping pod,’ nestled in the corner of the library. 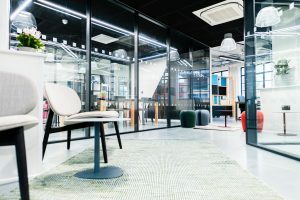 Although design and build is important, all coworking operators will know that the success of a space depends on its people. Once we’d designed and configured the space, the next step was to figure out how we were going to foster that all-important sense of community spirit. 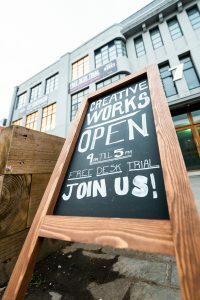 After a successful opening event that attracted a lot of new members, we decided to set up a Free Desk Trial initiative for new members, believing that it’s only fair our creatives get to try out the space before investing in a membership. Impressively, 45% of people who participate in the trial go on to sign up, so it really does work from a business perspective. 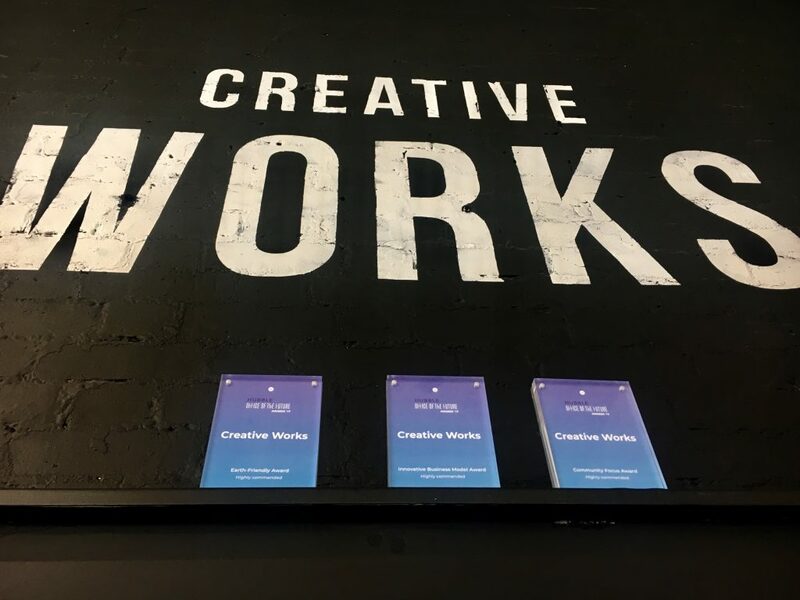 Creative Works offers so much more than desk space, and I think that’s what draws people in. Before we opened our doors in December 2018, we began to put together a program of events centered around learning, development, and well-being. We’re always adding fun things to our roster, but so far our events include: Yoga Mondays, monthly Sofar Sounds gigs, monthly Business Clinics (in which members can speak to a seasoned business professional about their challenges, skills courses e.g. in Adobe,) bi-weekly film nights, and monthly ‘boozy’ lunches (soft drinks are available, of course). Below, you’ll see Community Officer Emma and I enjoying some social time with our creatives. Coming ‘Highly Commended’ at the Hubble Office of the Future Awards in not just one but three categories is something we’re incredibly proud of, especially as we received them just three months after opening. We were particularly praised for our focus on sustainability, community, and innovation. Sustainability and circular economy have been at the forefront of our vision from the start. As mentioned above, 82% of our furniture is made from recycled or reclaimed materials, and we only installed carpets where absolutely necessary. Our LED lighting is energy-efficient and its Unified Glare Rating makes it kind to our members’ eyes. Even the coffee cups our environmentally-conscious building contractor used were biodegradable and recyclable! In terms of the layout, panoramic windows let in an abundance of natural light, and our quiet areas provide a screen-free oasis for our members to enjoy a cup of organic tea. As a CIC, we’re champions of circular economy. Growth and innovation is at the heart of what we do, not just profit margins. Hubble commended us for offering truly flexible solutions for creative businesses that are custom built to their needs and our dedication to promoting a balance between working and resting. Members have access to a free monthly business clinic and our talent incubator is designed to support local startups. Our background in education means we’re able of offer our members and creatives the best training and development opportunities in London at a competitive price, as well as the chance to work with one of BCE’s apprentices (with a free desk space thrown in). We wouldn’t have achieved all we have without Alexis’ hard work in harnessing the support of Waltham Forest Council and, of course, our valued sponsors: Charity Bank, Big Issue Invest, GLA, and CAN Invest. We were praised in this category for our focus on the well-being of both our members and the wider community of Waltham Forest on the whole. Our free business clinic, events, and on-site training courses allow members to evaluate their success and take their business to the next level. When it comes to the wider community, we’re part of the Blackhorse Road Enterprise Zone, FORGE, and the 2019 London Borough of Culture initiatives that offer support local creative projects. It’s all about local, local, local – from our coffee supplier to the people who deliver our workshops. It’s safe to say that we’re excited about lies ahead for Creative Works. We’ll continue to tailor our solutions and events to the needs of our growing membership body and add new ones as we go along. Just a few of the things in the pipeline include a celebration for Clean Air Day (we’ve signed the Clean Air Pledge) and networking sessions that will begin soon! 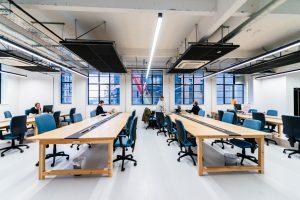 Justyna Michalik-Minken is Head of Operations & Communications at Creative Works, a flexible workspace designed for creatives freelancers and SMEs in E17, East London. Justyna can be contacted via LinkedIn. 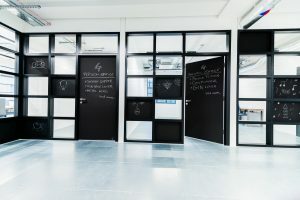 You guys really did well in a unique and innovative way starting from designing the office space to sign up the clients to your space. Really got inspired by the article as it made us to think . Thank you 🙂 that means that what we worked so hard on is successful in making a difference. Means a lot! The best thing about this space is how it makes me feel; inspired. Every tiny detail of my experience upon arrival, from coffee to mentoring to hiring additional staff for my project has been carefully designed to help me feel ready and confident to get stuck into creative work.